The boost to living standards from trade can particularly benefit the poor by lowering prices and hence their cost of living. Since the period of intense trade liberalisation that began in the 1990s, the proportion of the world’s population in poverty has shrunk by two-thirds. Average tariffs on manufactured goods have fallen sharply (yellow line in Chart 1). But services trade liberalisation has been much slower. 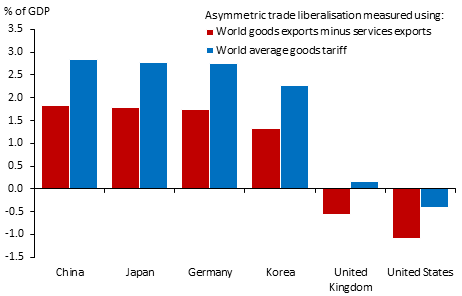 Some have argued that this asymmetry has meant that the resultant boost to trade flows has been asymmetric – those countries that are focussed on exporting goods have seen big increases in exports, but those focussed on services haven’t. This would mean that ‘levelling up’, by liberalising services trade, may help narrow these imbalances in future. A look at the data since 1997, presented in Chart 1, shows some support for this. The increasing imbalances between deficit countries, like the UK and the US, and surplus countries, like China, Germany and Japan, can be seen in their widening goods trade balances, in the blue bars. The red bars show that the US and the UK, where services are around a third and a half of exports respectively, have seen only a modest rise in their services trade surplus, the counterpart being that China, Germany and Japan, where services account for less than one fifth of exports, have only modestly expanded their net imports of services. While there are many other factors driving current account imbalances, global trade liberalisation could have played a role. But doesn’t all this ignore general equilibrium effects? Consider a canonical two-country open economy model, where each country’s exports are specialised in either “goods” or “services”. The current account measures the difference between domestic income and expenditure (i.e. net lending or borrowing from abroad). So, following Obstfeld and Rogoff’s classic result, only things which affect intertemporal decisions about spending relative to income should shift the current account position. In simple models where households immediately adjust their consumption in response to income shocks, changes in tariffs that cause a permanent change in a countries’ income should cause an equivalent change in consumption, leaving the current account position unchanged. If the shock changes the relative demand for goods produced by different countries, real exchange rates will adjust to offset this. However, this argument only holds in the simplest model, and realistic additions can overturn the result. For starters, consider frictions, like habits in consumption or borrowing constraints, which prevent households immediately changing consumption in response to income shocks. 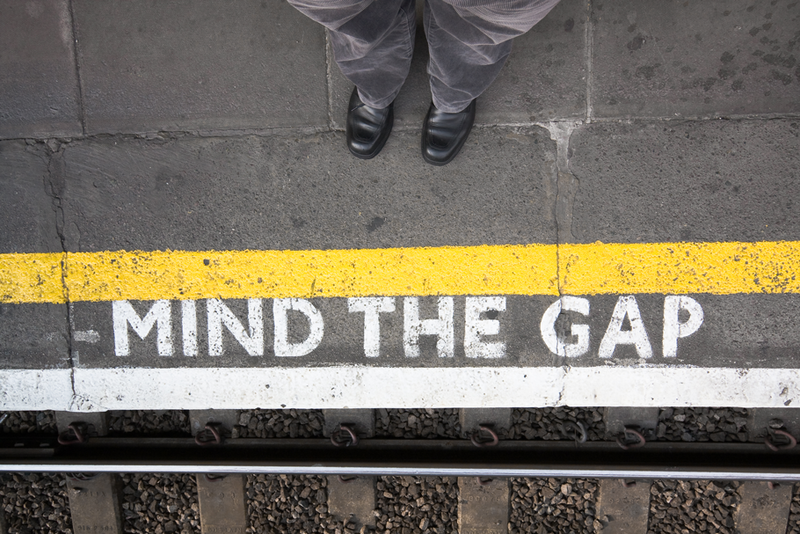 Gaps between income and consumption will open up, generating current account imbalances. Alternatively, think of a model with investment goods and capital. A reduction in goods tariffs leads to higher investment and production in both countries. But since the goods focussed country gains more, income-wise, than their services focussed counterpart, their higher savings more than pay for the extra investment. Those surplus savings are lent to the services focussed country to finance its higher investment spending. In a two-country general equilibrium model, current account imbalances open up, and can persist. Finally, financial frictions, or pricing frictions, can mean that real exchange rates under-react to shocks. After a reduction in goods tariffs, if the real exchange rate of the goods exporter does not appreciate sufficiently to offset the rise in demand for goods relative to services, the goods exporter will run a trade surplus. Current accounts are affected by many factors other than trade policy, so to estimate the marginal effect of trade policies we need to capture other fundamental factors. A well respected empirical framework for doing that is the IMF’s External Balance Assessment (EBA). They regress current account balances for many countries on a battery of explanatory variables covering economic “fundamentals”, such as demographic factors and the level of development, and policy variables, such as health spending, the fiscal balance and capital controls. Most of these are measured as the deviation from the relevant “world” counterpart, consistent with the idea that the current account cannot be determined by the country’s own characteristics alone. To the set of explanatory variables used by the IMF, we add measures of sectorally asymmetric trade liberalisation and interact these with the country’s comparative advantage in services (share of services in total exports in 1995, normalised by dividing by the share of services in total world exports). 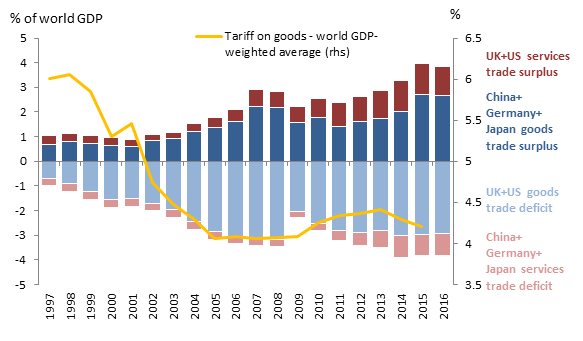 We use two alternative measures for asymmetric trade liberalisation: the difference between global exports of goods and services (relative to world GDP), and the world average tariff on goods. Using the first measure, the red bars in Chart 2 show the impact of the asymmetric trade liberalisation between 1995 and 2007 on the annual current account positions of some major countries. These are calculated by taking the change in global exports of goods minus services from 1995 to 2007 (+5.7pp), and multiplying this by [0.8 + (-0.7)*(comparative advantage of country in services)], where 0.8 and -0.7 are the estimated coefficients on this measure of asymmetric liberalisation, and on its interaction with comparative advantage, respectively. The blue bars use the alternative measure of asymmetric liberalisation. Averaging across these two approaches, our results suggest the impact has been in the region of 2.0% of GDP per year in additional surplus for China, Japan, Germany and Korea, and 0.7% and 0.2% of GDP per year in additional deficit for the US and the UK respectively. If past asymmetric liberalisation focussed on goods has contributed to today’s global imbalances, liberalising trade in services would be a potential remedy. Opening up trade in services should also boost global growth, whereas rolling back goods trade liberalisation would harm growth. But would liberalising services have a quantitatively significant effect on current account imbalances? To address this question, we ask by how much global imbalances might be affected if countries with the highest service trade restrictions were to liberalise. Again building on the specification used in the EBA, we add measures of each country’s services trade restrictiveness relative to the world average. Measures of services trade restrictiveness, from the OECD, are available only since 2014. So we assume that, for a given country, restrictiveness in all previous years is the same as in 2014. That is quite a strong assumption but studies suggest that services trade costs have been relatively stable since the mid-1990s. 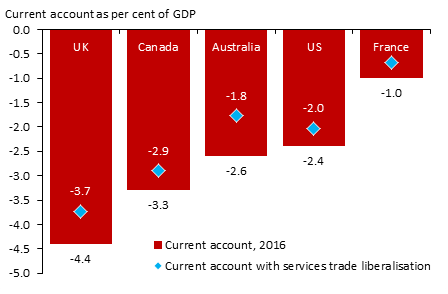 We find that countries with lower barriers to services trade relative to the rest of the world tend to have current account deficits. Chart 3 shows how service liberalisation in countries with the highest restrictions (e.g., India, Indonesia and China) would impact the current accounts of some deficit countries. We estimate that, for instance, the US current account deficit would be about 0.4pp narrower if those countries were to reduce their restrictions to the world average in 2015. For the UK, it could be around 0.7pp narrower. This could well be an underestimate as it does not capture the ability of countries with the greatest comparative advantage in services to profit most from other countries reducing trade barriers in services. There is also evidence that domestic regulation in services sectors can deter foreign entrants, and the IMF External Sector Report suggests that deregulation could reduce imbalances in surplus countries by raising their consumption and investment and thus imports. So a combination of lower trade barriers and deregulation could have more powerful effects. There are good theoretical reasons, as well as some empirical evidence, that because the liberalisation over the past couple of decades has been skewed towards goods trade, this has contributed to the widening of trade balances. Our results suggest that liberalising services trade can indeed help narrow these imbalances. That means that alongside the traditional channels by which trade openness makes both sides better off, there may also be an important spinoff benefit in terms of reducing global imbalances. Mark Joy, Noemie Lisack, Simon Lloyd, Rana Sajedi and Simon Whitaker work in the Bank’s Global Spillovers and Interconnections Division. Next Post Will Pay Clawback Tame Damaging Risk-Taking In The City?